We are all visual. It is much easier and faster to express an idea, explain a concept or show someone their performance through the use of visual aids. Laundry plant employees are no different. Harness the power of communicating visually with the deployment of our Visual Workplace. Employees see their progress - in color and easy to interpret shapes. No more trying to sift through the rows and columns of spreadsheets and numbers. The use of visual dashboards in real-time helps to track employees, analyze reports, see which equipment is available, and much more! Spindle provides the right information, to the right people, at the right time, while delivering 10% increase in employee productivity. Getting quick and detailed reports is essential to any business who is trying to improve their bottom line. A lot of personnel struggle on a day-to-day basis with trying to improve on the efficiency of their reporting. The best type of reporting is getting accurate information at any moment. That's where real-time reporting and the use of visual dashboards are a game changer. Visual dashboards and real-time reporting are essential tools that can be used to get the right information, to the right people, at the right time. 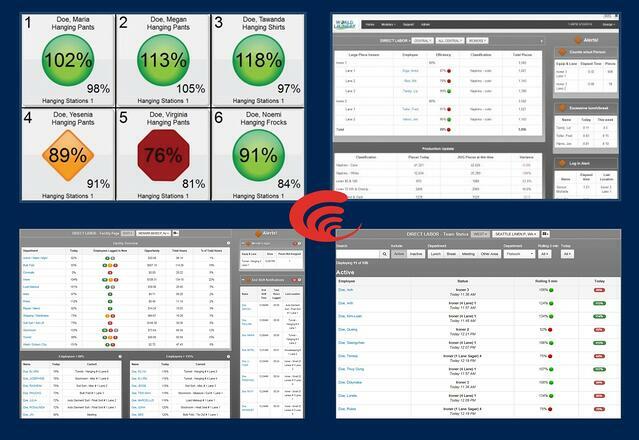 Spindle's visual dashboard, displays how employees are progressing through their shift's and an overview of if their equipment is running efficiently. As they are performing their day-to-day tasks, they can see their overall performance and how they compare to their fellow workers. This naturally increases the person's productivity and efficiency. Additionally, the laundry plant manager benefits from the same visuals. They can make necessary changes on the fly to ensure all processes are running at max capacity without negative effects to the bottom line! Actionable data is just a quick view away. As the Spindle system captures all of this data and puts it on display, it is also automatically aggregating the data into easy to use reports. Managers can utilize their time analyzing current and accurate reports rather than wasting time trying to acquire accurate information. With manual reports, by the time the information is thoroughly analyzed, many times it is already outdated and irrelevant. The visual workplace and real-time reporting improves overall productivity, cost, and quality. Need help with integrating these tips into your laundry operation?